Nicholas Grossman and Dominic Faulder (eds.). 2011. 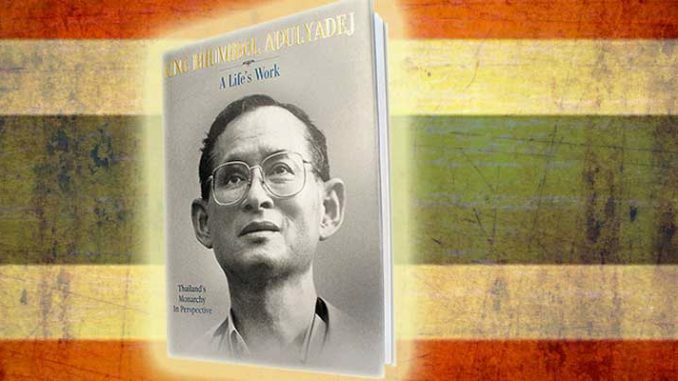 King Bhumibol Adulyadej, A Life’s Work: Thailand’s Monarchy in Perspective. Singapore: Editions Didier Millet. 383 pages. In 2008, when it had become impossible for any credible journalist to ignore the entanglement of the palace in Thailand’s unfolding tragedy, I wrote an analysis on Thailand’s King Bhumibol Adulyadej for Reuters. A conference call was convened with top managers plus a Thai lawyer hired to provide legal advice on what could safely be published. For almost an hour we discussed the article, with the lawyer rejecting every point as too risky. “So what can I say?” I eventually asked. There is a desperate need for Thailand’s more reasonable royalists to step up and restore some sanity to the situation. The international media also has a crucial role to play, because if they collectively resolve to report the reality of what is happening without undue deference to the ridiculous strictures of the lèse-majesté law, its enforcement will no longer be sustainable and sensible debate can begin. These were stunning claims. Unfortunately they proved totally dishonest. The depressing conclusion to be drawn from this publication is that sanity is in short supply even among moderate royalists, and foreign journalists lack the courage to help Thailand face reality. 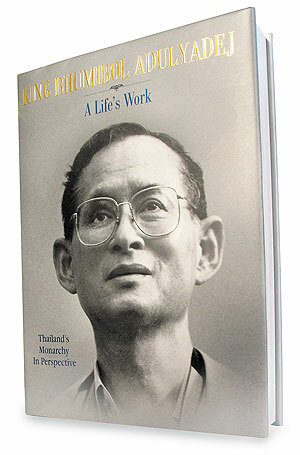 The most important thing to understand when assessing any book about Bhumibol is that — as Anand and every journalist and academic who worked on the project must be fully aware — it is impossible to write a credible factual account of the King’s reign without broaching some of the most taboo subjects in Thailand’s modern history and radically reappraising what can be legally said about the monarchy. Nobody expects a royal hagiography to be a warts-and-all exposé that reveals every skeleton in the palace closets, but Anand insisted this book would be an accurate narrative, and the involvement of a vast team of foreign scholars and journalists was touted as proof. Instead, all we get is a fairytale. A Life’s Work’s most glaring departure from reality is the unsustainable claim that the King has never interfered in politics apart from two famous occasions, 1973 and 1992, when he stepped in to halt military massacres and restore democracy. In fact, the palace has meddled incessantly ever since the 1970s, as Paul Handley’s brilliant 2006 biography The King Never Smiles demonstrates beyond doubt. The monarchy was intimately involved in events leading up to the appalling massacre of students at Thammasat University in October 1976 and the authoritarian era that followed. From the 1980s, the palace used General Prem Tinsulanonda as its political proxy, first as prime minister and then head of the Privy Council. And since 2005, the royalist establishment has been actively seeking to crush Thaksin Shinawatra, the most popular politician in Thai history, with disastrous consequences. In fact, Bhumibol could easily have halted the coup by ordering the royalist generals to stand down as they rolled their tanks into Bangkok. He chose not to. For Pridi Banomyong, the coup and accusations against him after King Ananda’s death were the final blows to his political career. As the wartime regent and incumbent prime minister, he had at the very least failed to keep King Ananda safe. Many did not believe Pridi had played any role in King Ananda’s death, but after the 1949 failed coup, he never came home and offered no explanation himself beyond saying he did not know who was responsible. For these statements to be made in 2011 in a book claiming to be a serious scholarly work is shameful. Besides its cynical dishonesty, A Life’s Work is also undermined by a tendency to treat even the King’s most mundane accomplishments with sycophantic reverence. Bhumibol is praised for such non-achievements as being born in America (page 47), having “straddled two centuries” (page 48), or sharpening his own pencils and cleaning his own saxophone (page 114). This kind of obsequious nonsense does Bhumibol no favours, detracting from genuine appreciation of his real achievements. Amid the fairytales and dross, there are a few worthwhile chapters. The sections on lèse-majesté by Streckfuss and the Crown Property Bureau by Porphant are genuinely useful, but both are watered-down distillations of work they produced elsewhere. Furthermore, the chapter on lèse-majesté repeats the common but spurious claim that Bhumibol’s 2005 birthday speech signaled his support for reform of lèse-majesté law. If Bhumibol really wanted the authorities to adopt a saner approach, he could surely make this happen. But as A Life’s Work inadvertently demonstrates, the King and his acolytes have become so lost in their fairytale world that it is simply too late for them to turn back. Abandoning lèse-majesté law would force them to acknowledge unpalatable truths about the failure of the palace to stay above politics, the divisions over the succession, and the tragic stories of 1946 and 1976. They fear that allowing the truth about these issues to emerge would destroy the monarchy. They may well be right. It’s understandable why Bhumibol’s inner circle would try to defend his crumbling reputation. It is less justifiable for foreign journalists to allow themselves to be used so crudely to give spurious legitimacy to palace propaganda. Reporting on Thailand is difficult and dangerous, but a basic principle of ethical journalism is that if you cannot safely tell the truth, at least acknowledge that you cannot, and explain why. Never, ever lie. Perhaps the saddest thing about A Life’s Work is that it’s pointless. When Bhumibol passes away, the foreign media will inevitably start reporting the truths they avoided while he was alive. The stories the royalists tried so hard to suppress will come out in the end. You cannot run forever from reality. Andrew Macgregor Marshall constantly hates the Thai Monarchy, especially King Bhumipol. He clearly supports the Red Activists. All of his writing is based on imagination and reading from here it is mostly from the Red side because it is almost the same as other articles from the Red media. During this time, only the Monarchy has been hit by western media, not because they know what’s happening but with the intention to make the Monarchy a monster, this is backed by the US and has been done systematically through media and propaganda (you can find article from VOA). This is for America’s benefit over Thailand’s assets and resources with cooperation from greedy Thais land destroyers and thugs. Whatever the future of the Thai Monarchy will be, we, the Thai people will make decisions of our own, it’s our destiny, not Andrew’s, not Kyoto Review’s, but Thais. I would bet on Mr. Marshall. It’s the 1st of December and it has been nearly a month and a half since the revered King has passed on. The world community at large has been largely sympathetic about the loss that the Thais have suffered. The King has done so much for the Thais i.e., spearheading more than 4000 royal projects to help those people living in rural Thailand. Sure this book stated mainly the positives of His reign but I think the Thais deserve a good “fairytale”. As far l can see, King Bhumibol was the only person who worked so hard for all his people and his country. Most of the thing in this book is quite negative and ran out from the truth.